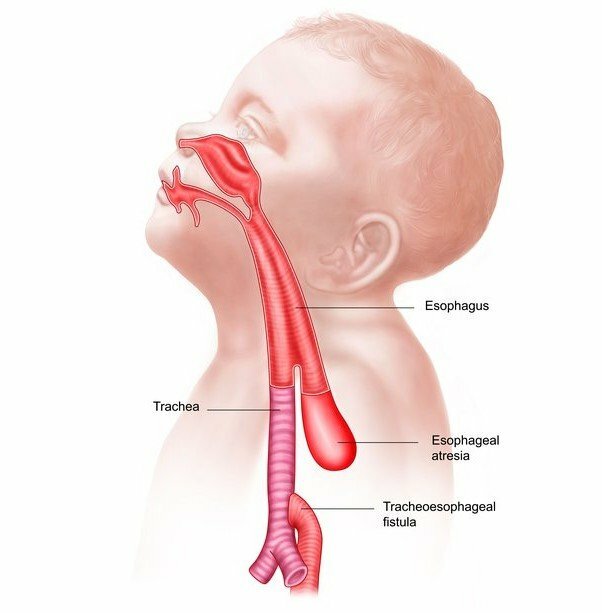 Esophageal atresia is a rare birth defect in which the food pipe (esophagus) is blocked. The baby’s feed cannot pass form their throat to their stomach. What are the types of esophageal atresia? Esophageal atresia with tracheo-esophageal fistula (EA+TEF) is the commonest type. In this type the food pipe is blocked in the neck and the other end of the foodpipe is connected to the windpipe (trachea). The other uncommon types are ‘pure atresia without fistula’ and ‘H variety of trachea-esophageal fistula’. It is a rare congenital anomaly found in 1 out of 4000 babies. This anomaly can be associated with problems with heart, kidney and spine. The child after birth has a lot of saliva in mouth and may have breathing problems. The child will vomit out the feeds. Later, the child will develop pneumonia and may succumb. Pediatrician who is looking after the baby may try to pass a tube through the baby’s nose into its stomach (naso-gastric tube or NG tube) and finds that it is not possible. Esophageal atresia can rarely be diagnosed before birth. There may be excessive amniotic fluid (polyhydramnios) and a dilated food pipe in neck. Choking on feeding, recurrent aspiration pneumonia are the symptoms of ‘H variety’ of tracheo-esophageal fistula. Such patients usually present during infancy. X-ray chest will show the naso-gastric tube curled up in neck. If the abdomen shows gas filled intestinal loops, it is a case of EA+TEF. If the abdomen is gasless, it is a case of pure EA. Blood investigations, sonography of the abdomen and echocardiography are other tests to be done. Surgery is the only treatment and is carried out through the chest. Surgery joins upper blind end of esophagus to the lower end of esophagus and forms a continuous tube. In case of tracheo-esophageal fistula, the fistula is disconnected from windpipe and closed and esophageal end is connected with blind end of upper esophagus. The surgeon performs a dye study (contrast swallow) in radiology suite on 5th post-operative day to check for any leak. If there is no leak, feeding can be started. In cases of ‘long gap esophageal atresia’ the gap between the ends does not allow the surgeon to connect both the ends and a different approach (esophagostomy and gastrostomy) is required. In cases of ‘H variety’ of TEF, bronchoscopy confirms the diagnosis. Surgery is required to close the fistula. It is a major surgery. It carries a small risk of infection and bleeding. There is a small chance of leak from the suture line (wider the gap between two ends, higher the chances of leak) which usually closes on its own when given extra time. The overall outcome depends on maturity of child, weight of child, preexisting pneumonia (sepsis), need for ventilator support and associated other anomalies. The overallsurvival rate is 80 - 90%. What is the long term future of the child with esophageal atresia?